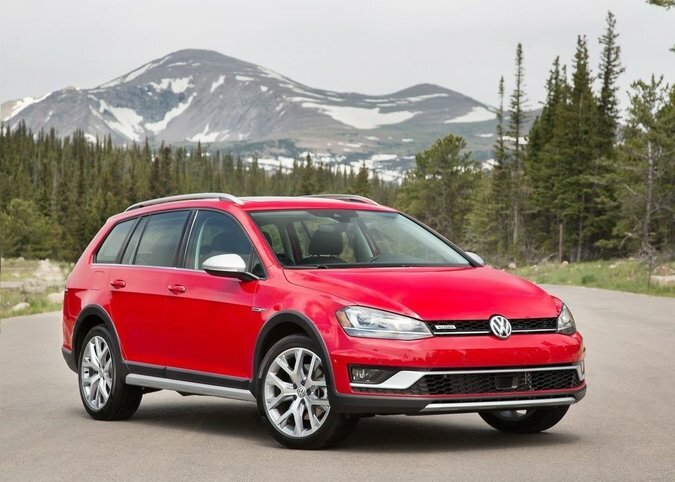 Home > Headlines > News > Golf SportWagen Alltrack Coming! Just announced for U.S. - we hope it comes to Canada too! Coinciding with the arrival of the all-new Golf SportWagen, currently available in dealer showrooms, Volkswagen is pleased to announce that the all-wheel-drive Alltrack model will go on sale in 2016 as a 2017 model. "We have heard from dealers and customers that they want to see a Golf SportWagen with the all-terrain capability that comes from all-wheel drive," said Michael Horn, President and CEO of Volkswagen Group of America, Inc. "We are delighted to introduce the SportWagen Alltrack in 2016 in the U.S."
Technical and visual differences between the Golf SportWagen and the Alltrack include a 4MOTION® all-wheel-drive system, nearly an inch higher ground clearance, wheelarch moldings and flared side sills that offer body protection, newly designed bumpers, and an even more upscale interior. The 4MOTION all-wheel drive system uses the latest generation Haldex-5 coupling, activated via an electro-hydraulic oil pump. In normal driving, the Alltrack acts like a front-wheel-drive car for better fuel economy, but as soon as the system detects wheel slip, up to 50 percent of the drive torque can be shipped to the rear wheels. In addition to the Haldex coupling that acts longitudinally, electronic differential locks (EDL) at the front and rear axles act laterally in concert with the electronic stability control system. The system briefly brakes a wheel that is slipping, enabling uninterrupted and stable transfer of drive power to the wheel on the opposite side. In combination with the higher ground clearance, this 4MOTION all-wheel drive system helps to give the newest Golf SportWagen the off-road capability and load-carrying capacity of a compact SUV along with the on-road manners and fuel economy of a compact wagon.